Is a Normal Market in Our Future? Let’s put it on the table right away: Our real estate market did not perform at the same level in 2018 as it did in 2017. But that does not mean we had an unsuccessful market in 2018; nor does it necessarily mean we should brace for a difficult market in 2019. We just have to apply a bit of perspective. Taken in the context of historical numbers, it appears 2017 was an “outlier,” especially between July and December. There was a frenzied demand throughout 2017, reflective of (but not nearly as severe as) our metropolitan neighbor across the Sound. 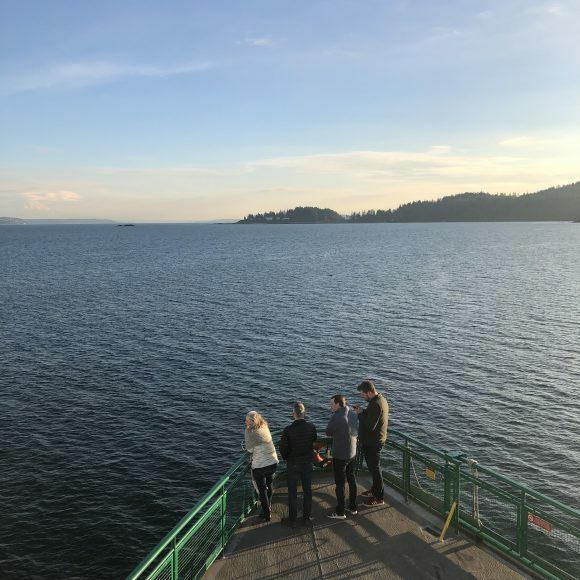 On Bainbridge, we had a peak during the second half of 2017, which flowed into the early months of 2018. But then the frenzy cooled, as it did in Seattle, and we moved toward a slower pace in the second half of the year. 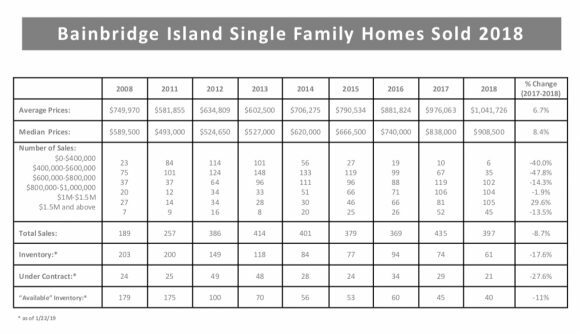 (There were 314 homes and condominiums sold on Bainbridge between July and December 2017, surpassing the previous high of 290 during that same period in 2015). When viewed historically, 2018 appears to be much closer to “normal” than 2017 was. And, when taken in the context of the larger local and national economies, we actually believe our real estate market held up very well. 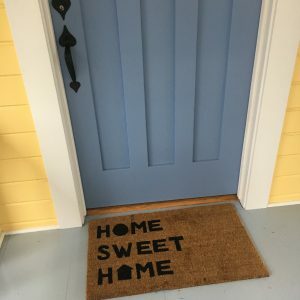 Thenumberofhomessoldduringanyperiodisonlypartofthepicture.Whenwelookatrealestate appreciation, 2018 was very successful. For the year, the median price for homes and condominiums combined rose almost 8% in 2018 (and homes alone rose 8.4%). The second half of 2018 saw appreciation of almost 5% over the second half of 2017. These are healthy num- bers and consistent with a healthy market. Using general statistics (like the median price) only gives us an idea of the movement of the market, and not necessarily of any individual home. But it does give sellers an inkling of the direction of their homes’ values. The rule of thumb says that a home needs to be owned for at least five years to really benefit from a market’s movement. Comparing the median home price sold at the end of 2013 ($527,000) with the same price at the end of 2018 ($908,500), we have seen a 72.4% increase. So if you had purchased a home in 2013 and were to put it on the market today – assuming it was properly presented and marketed – you would probably realize a healthy return on your 2013 investment. When we look at the bigger economic picture, we do not see financial institutions collapsing or other deep recession signals, so we ascribe the market’s change to a shift from a heated to a more normal market. That being said, sellers need to acknowledge they are competing for buyers, and buyers are more discerning and disciplined in their approach. Pricing, presentation and negotiating – all areas where good agents bring value to the table – are critical for sellers to be able to achieve the best net value from their homes and condominiums. The condominium market experienced an even more dramatic drop-off in the second half of the year. At the end of the first half, 2018’s condo sales surpassed 2017’s but by the end of the year had fallen behind in total numbers (126 sold in 2017, 109 in 2018). However, when we look more closely, the area of steepest decline was in the $800K-$1M price range (24 sales in 2017 and 10 sales in 2018). This could have as much to do with inventory as market shift. Two new on-island projects, The Roost and Residences at Pleasant Beach, both sold briskly in the second half of 2017 and were completely sold out by the first half of 2018. No other new projects came to the market in 2018, so it appears supply might have as much to do with the drop as demand. As with homes, the median price of condos had a healthy increase of 8.6% over 2017. 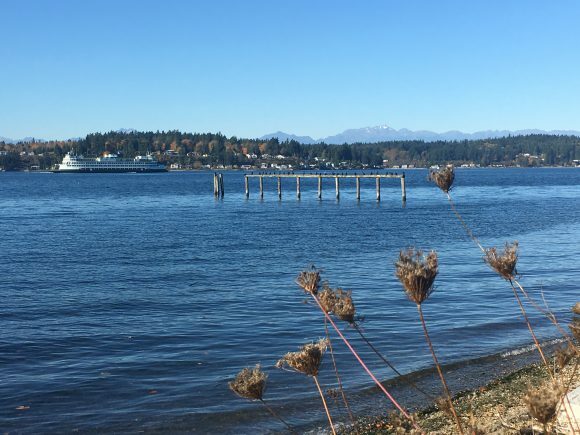 The prognosis for the Bainbridge condominium market is very positive. There are two buyer types who are especially drawn to condos: people needing more affordable residences and “downsizers.” In 2018, 42% of the condos sold (46 sales) were priced less than $500K compared to 17 homes sold for less than $500K. At the upper end of this segment of the market, the downsizers were the driving force in the over $800K sales and quality inventory was lacking in the second half of 2018. Land sales in 2018 were also down compared to 2017 (31 in 2018 versus 41 in 2017), but the median price increased a whopping 60% ($400K in 2018 versus $250K in 2017), although 58% of the sales were less than the median $400K. One has to be careful not to read too much into statistics when applied to such a small population, but it certainly indicates land values are healthy. As we kick off 2019, we know it will be an interesting year. There is a lot of uncertainty out there and it is difficult to predict how it will affect our market. Still, the regional economic picture, which has a tremendous impact on our market, is healthy with a positive outlook. The bottom line: we anticipate a more “normal” market this year. 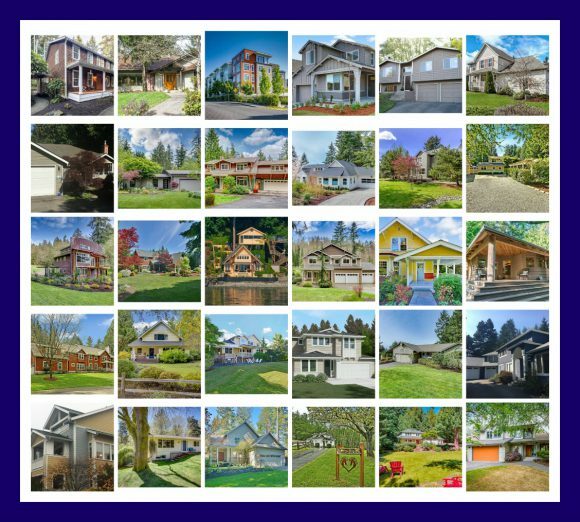 Regardless of the market, our mission at Windermere is to strive to make sure all our clients, buyers and sellers both, will do as well as they possibly can in the market they find themselves in. 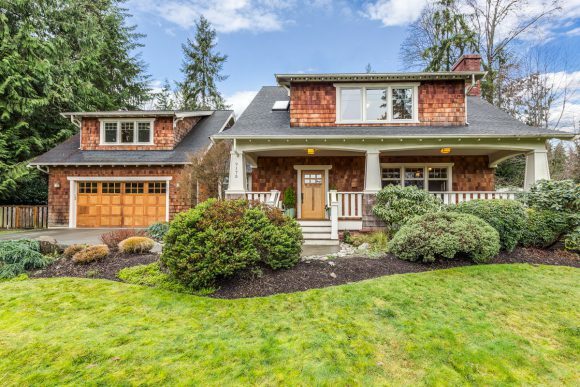 9175 Ferncliff Avenue NE is a quality constructed Craftsman home in the convenient Ferncliff Area of the island. 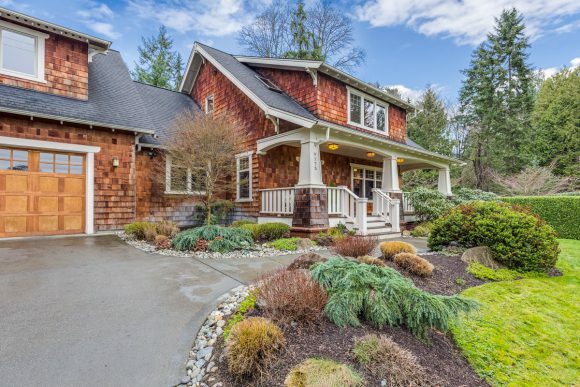 The home emulates the quintessential Bainbridge style and is anything but cookie-cutter. Custom built by VanWinkle, this property offers a 3,367 square feet on a lovely, private, .47 acre lot tucked behind a mature laurel hedge. Public beach access is across the street on Yaquina Avenue. 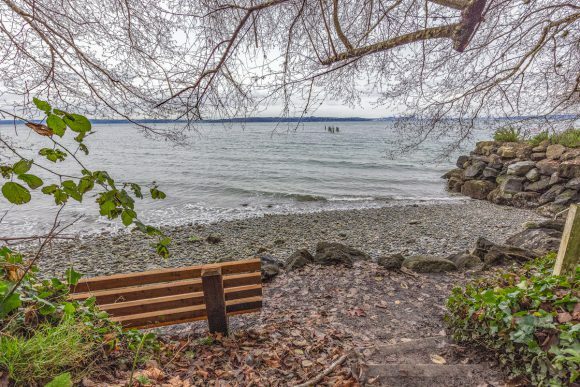 Only 2.2 miles to the ferry this property offers elbow room from your neighbors, but incredible proximity to the ferry, Winslow, and schools. This home sits on a large, private property, conveniently close to Winslow, the ferry and schools. The home is 3,367 square feet with three bedrooms, a family room, living room, home office and guest suite with full bathroom, all on a large .47 acre fenced lot. 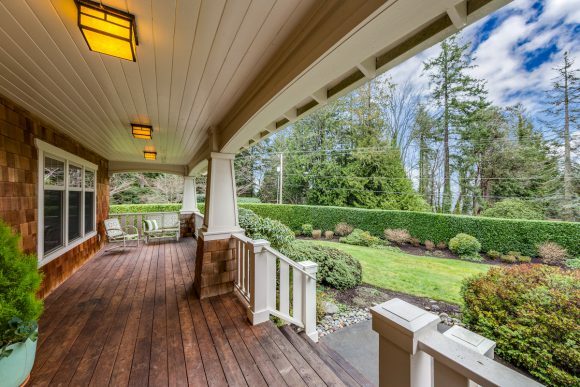 Peek-a-boo Puget Sound and Seattle views from the front porch, living areas and master suite. You can feel the warmth and quality as you walk into the home. 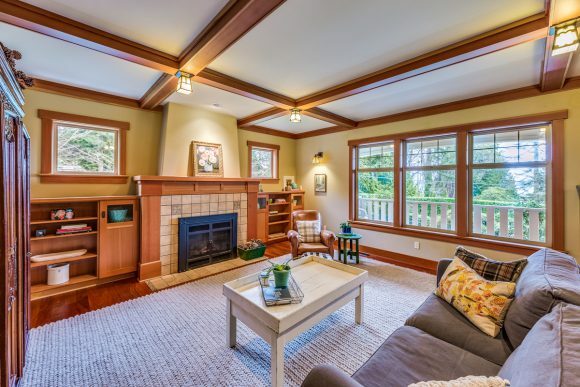 Hardwood floors, fir trimmed windows, solid wood doors and box beam ceilings make for a grand first impression as you step into the living room.Thoughtful built-ins, custom lighting and large windows can be found throughout the home. The kitchen is the heart of this home. 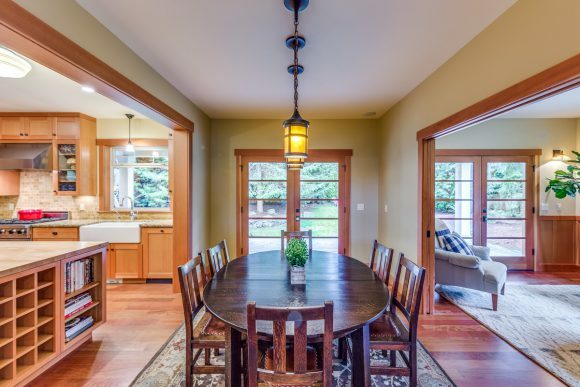 Large and open with quality fir cabinetry, ample counter space on the butcher block island or granite counters, high-end Viking appliances, a breakfast booth, and a walk-in pantry (and a second pantry around the hall too). The dining area, kitchen and family room in the home. The upstairs master suite. 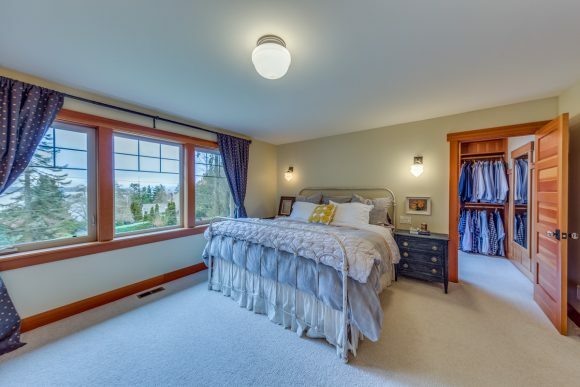 Find a five piece master bath with claw foot tub and spacious walk in closet with fir shelving. 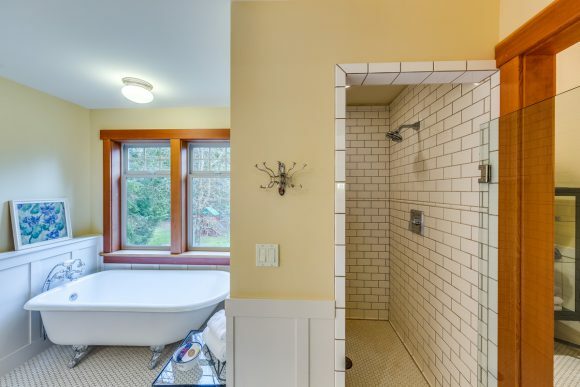 The charming master bath has classic tile, the claw foot tub, double sinks, a large walk-in closet and a private water closet. The private guest suite/nanny suite is spacious, with its own sleeping room/bonus room, full bath and private stairs off the back hall. There are two staircases in the home. The home is across the street from beach access. It is .2 miles away at the base of Yaquina Avenue. Charming Craftsman home on a private in-town lot close to ferries, Winslow and public beach access – at the base of Yaquina Avenue. Peek-a-boo Sound and Seattle views. 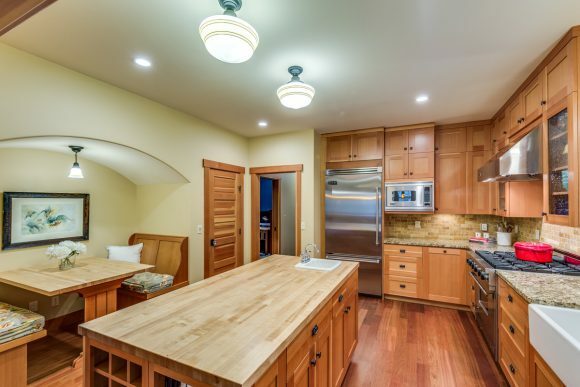 Chef’s kitchen with Viking appliances package, fir cabinetry, cozy breakfast nook and granite counters. Three bedrooms plus an additional guest suite (or nanny quarters) with full bathroom plus bonus room. Downstairs has a home office and family room. 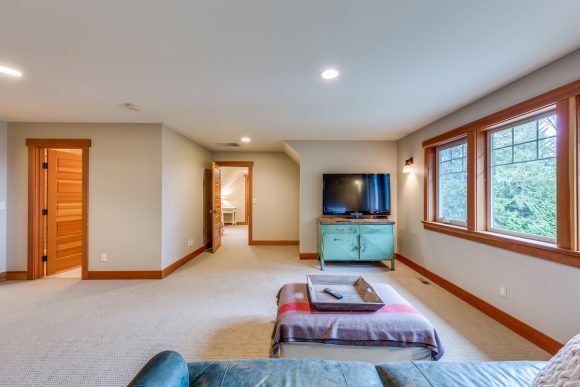 Quality craftsmanship with box beam ceilings, hardwood floors and custom lighting. A rare in-town home that exudes warmth and style. Click here to visit this home’s dedicated website. 2017 is in the books. And 2018 is already in the works. 2018 is going to be another busy year. I am so grateful for the 30 plus islanders who trusted me with their home purchases or home sales. Or both. It was a fun and action-packed year working with both repeat clients making moves around the area and helping even more newcomers discover and settle into our amazing island. I am humbled and thankful for the clients who put their trust in me to help them navigate this complex, completive market. I am energized and excited to see what 2018 has in store. Stay tuned for next blog post about my Top Ten Favorite Homes of 2017. There is one home I still can’t get out of my head . 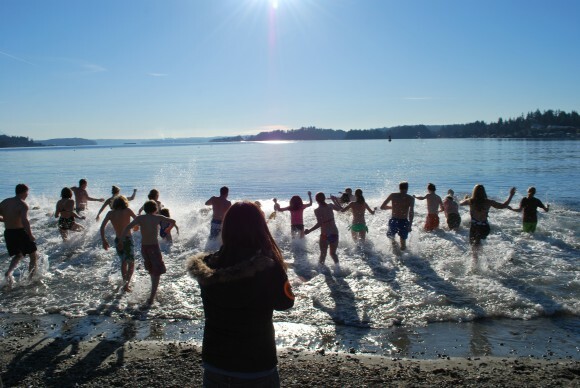 . .
Polar Bear Plunge on Bainbridge Island. Another very Bainbridge tradition. Make sure you don’t party too hard on New Year’s Eve so you can make it to the Polar Bear Plunge on New Year’s Day. 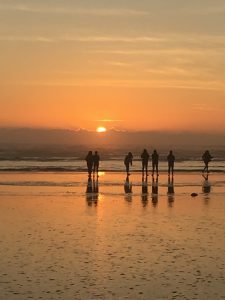 No need to sign up, just show up a little bit before noon on January 1st, 2018 at Lytle Beach with a swimsuit, a towel, and enough nerve to jump in the very cool Puget Sound waters. Every year a local takes charge and blows a horn to signal the start of the plunge. Parking can be tight and tricky, so I’d suggest arriving around 11:30. Some folks come earlier and make a bonfire. Fingers crossed for another sunny one!